The Shire of Heronter has regular A&S gatherings. 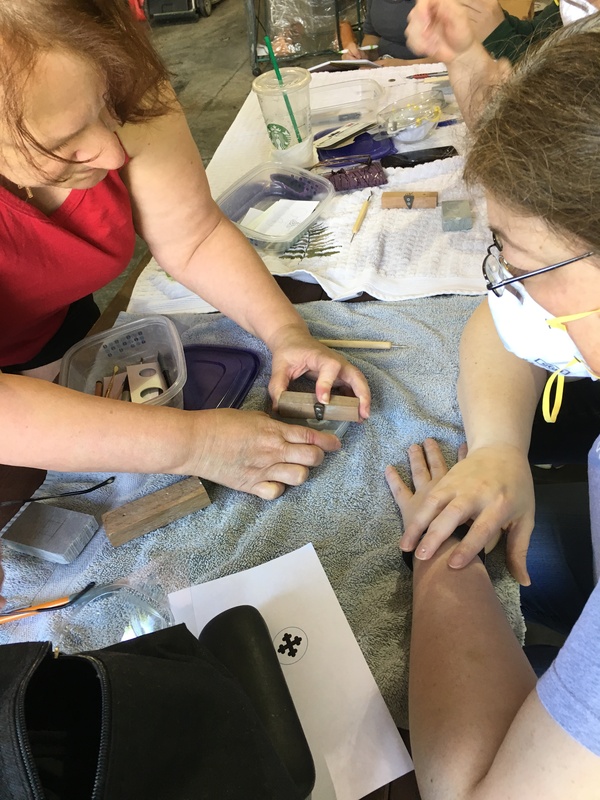 For our most recent gathering, Lady Edana the Red came up from Debatable Lands to teach pewter casting. On Saturday, June 24th, 2017, members of the Shire assembled at the home of THL Keinven Ragnarsdottir and Baron Malcolm Fraser at 10 AM. Fortunately, it was a clear and sunny day, pewter hates rain and high humidity. 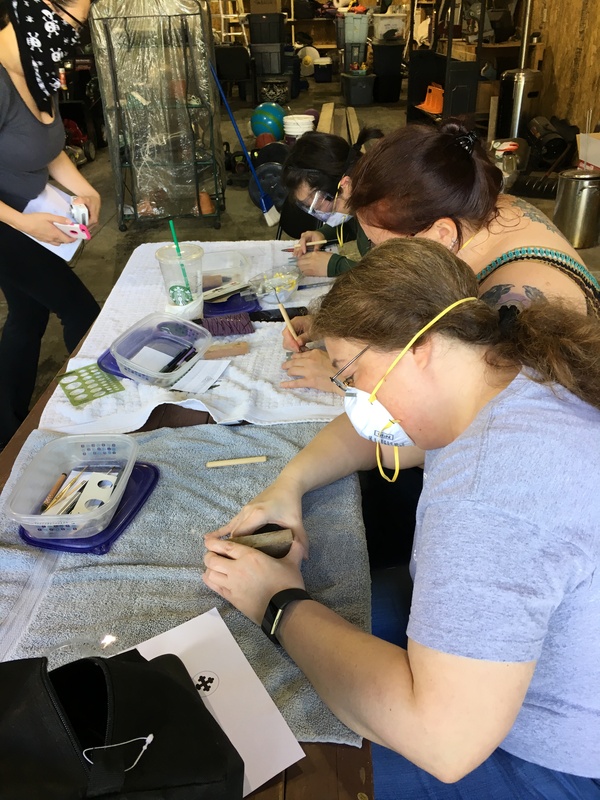 Everyone had glasses or other eye-protection and paper dust masks were issued to all. Soapstone creates dust easily and it’s not something you want to breathe in. Long hair was tied back and everyone had been instructed to wear long sleeved tops to expose as little skin as possible. 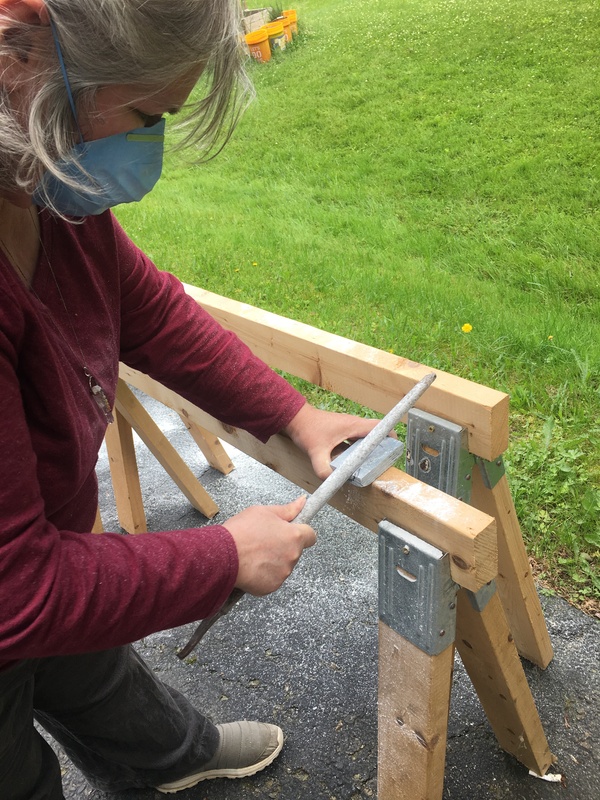 We worked outside to not leave stone dust on the furniture. Picnic tables were covered in old towels for easier clean up. We were each issued a ‘carving kit’, a small Tupperware tub containing a marker (black), a plastic template for drawing circles (quarter and dime sized), a mechanical pencil (red shaft), a carving tool (wooden handle, scraper at one end, point at the other), a dental pick (brass), a crayon (red) a few scraps of paper (blueish due to shadows), a small piece of soapstone (I’ve already started carving mine), a few curls of sandpaper (at base of mechanical pencil) and a coin level (at top of box, on its side). The latter is a small piece of metal mounted to a small scrap of wood. The next step is to start carving the mold. 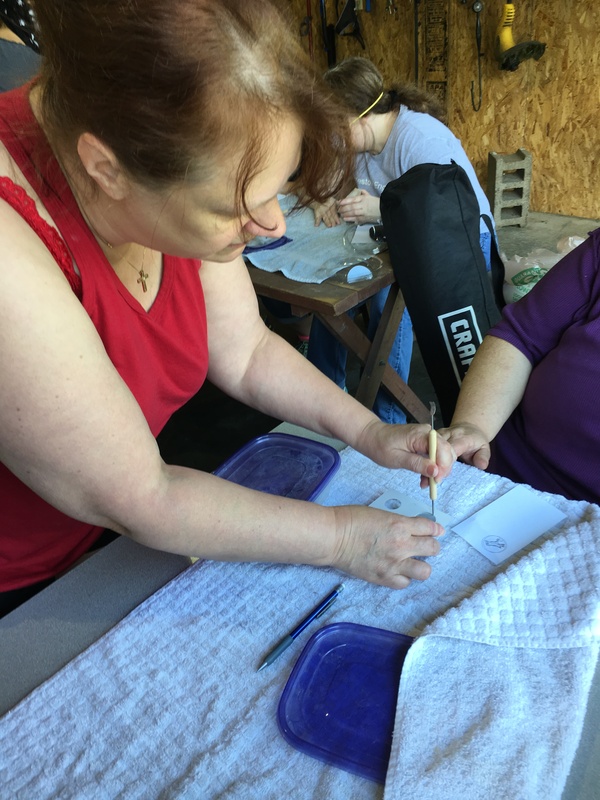 Above, Lady Edana demonstrates how to use the plastic template and the carving tool to inscribe a circle on the soapstone mold to about the depth of a quarter. 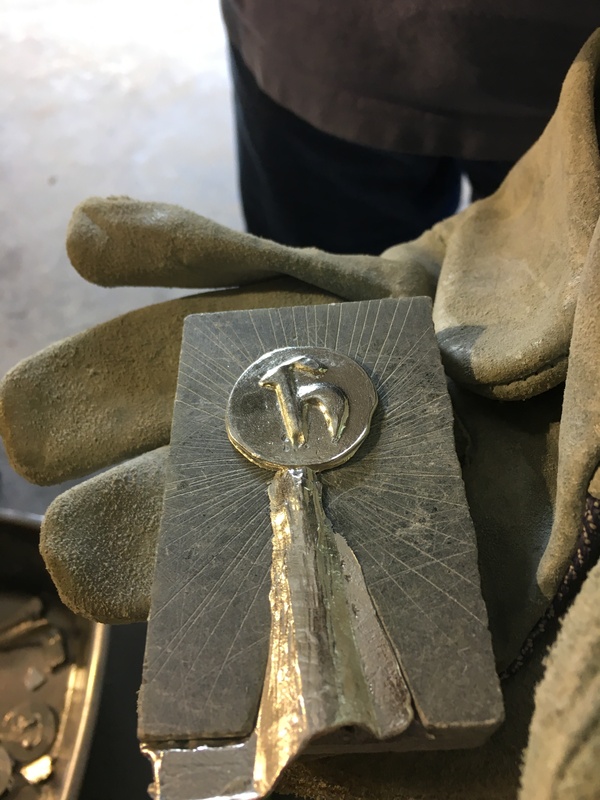 Once the circle has been inscribed into the mold, the coin level is inserted into the groove and gently pulled toward the center of the circle. The small block of wood rides across the face of the stone while the metal point scrapes the coin shape to a uniform depth. Do not force the level, it will leave a groove. Just keep lightly scraping a thin layer at a time until the coin shape is complete. Lady Edana demonstrates using the coin level to Duchess Dorinda. Dorinda’s token design, a cross bottony from her badge, is by her left wrist. In the first photo above, my completed coin shape can be seen on the mold next to the kit. 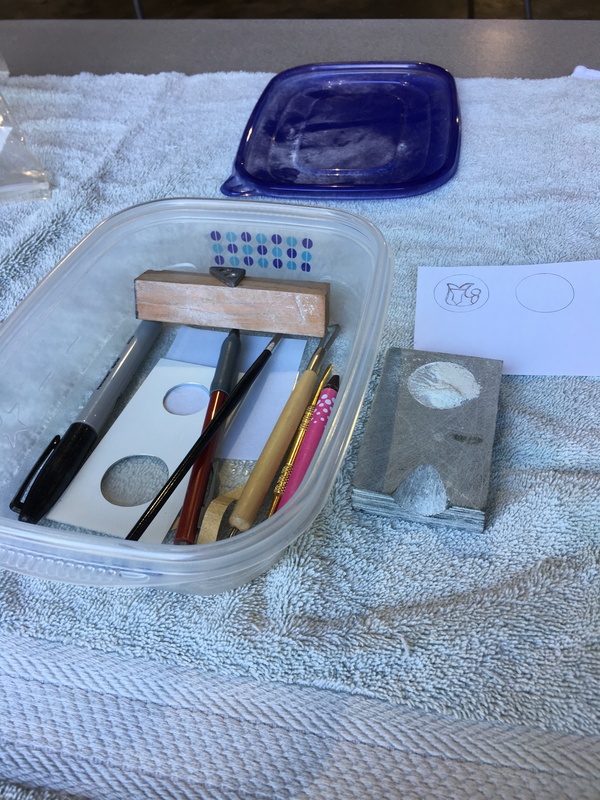 The pile in the center is the soapstone dust from carving the coin and will be brushed out with the paintbrush onto the towel. Once the coin blank is complete, the next step is to carve the design onto the coin. Remember that the design is backwards, so letters need to be reversed. The deeper into the mold, the higher the image will be above the coin blank. A single layered design is best for a first attempt, however my design was a vair bell on a slipper, so the slipper was carved into the coin, then the vair bell was carved inside the shoe, deeper into the mold. The small curls of sandpaper are used to smooth out designs and erase tool marks on the mold. To test your carving, Play-doh™ is your friend. Press a small piece into the mold, then gently pull it out by the edges. Shown below, a small piece of red Play-doh™ is pressed into Dorinda’s mold and gently pulled out to reveal the final design. If you are not satisfied with your design, you can continue working on the mold and testing until you are content with the design. The next step is to create the sprue, the channel that the pewter will be poured through. Lady Maggie Baxter, above uses a large metal file to begin the sprue. Knife cuts will bring the channel up to the design without damaging it. The location of a sprue hole depends on the design. You want the pewter to pour into the entire mold, not rise into the smaller details. If you’re going to have a loop on top of your token, the sprue should probably enter the bottom of the coin. Next, vent holes are cut into the mold to allow air to escape as the liquid metal enters. 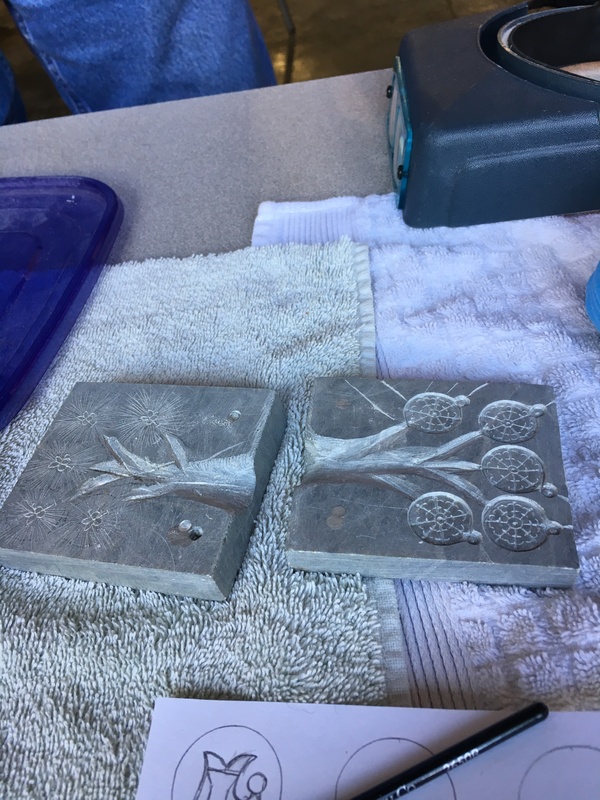 Otherwise, air pockets and bubbles will form and the pewter won’t fill the entire mold. For safety considerations, Lady Edana’s assistant did all the pouring. A second piece of soapstone was held against the first, to provide a back to the medallion. The second piece had a cross-hatch design which created a texture on the back. 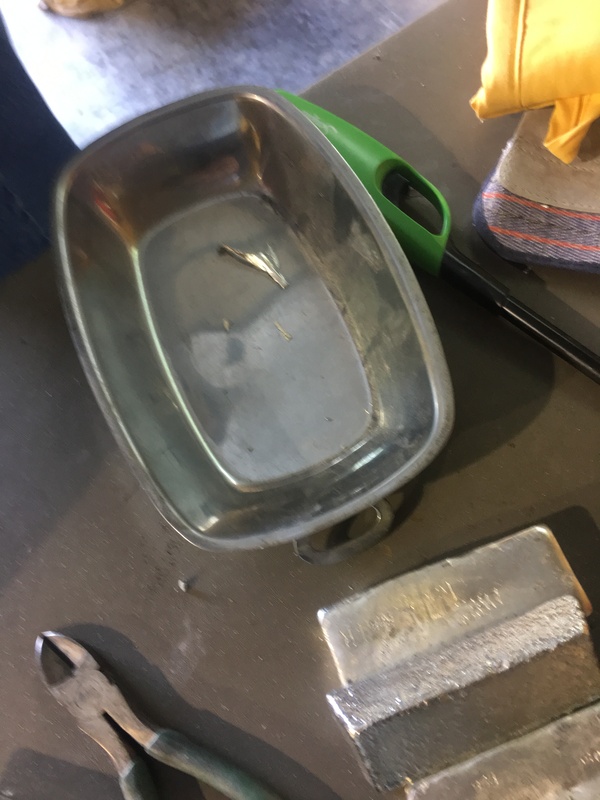 A metal catch basin to hold the pewter while it cools, a camp stove starter, wire cutters for cutting sprue, and several bars of pewter waiting to be melted. Notice that we are using an ordinary camp stove to heat bricks of pewter in a steel crucible. Pewter has a melting point around 230* Celsius. The exact temperature depends on the specific blend of metals that make up the alloy. The pieces are small enough that they can be held them together in a welder’s gauntlet. If we were doing a larger piece, the mold halves would be tied together and placed on a table. Note that there is another mold on the stove near the burner. A warm mold keeps the pewter liquid for a few moments longer and allows it to flow more easily into small details in the mold. 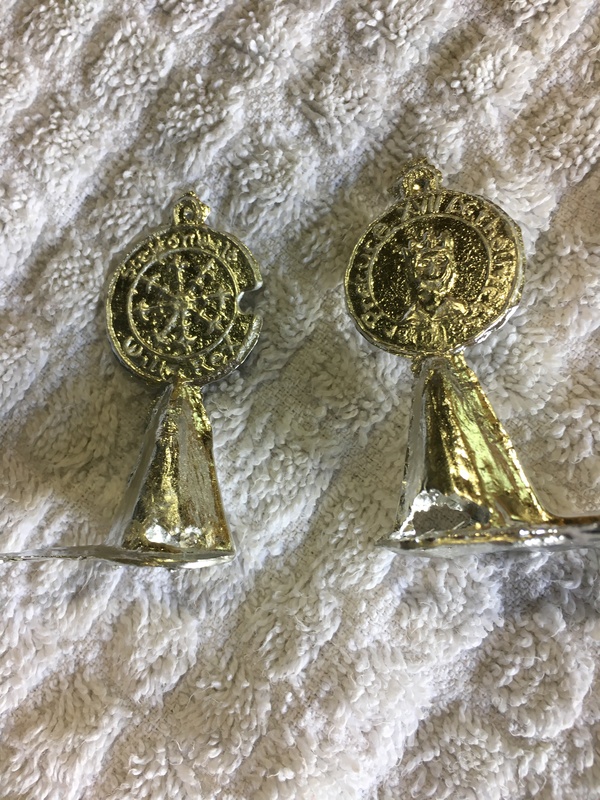 The pewter solidifies within a minute and the mold is opened. This is Lady Helena’s stylized H and the sprue enters the medallion at the bottom. The medallion is dumped into the metal basin and allowed to cool to the point it can be handled with bare hands. 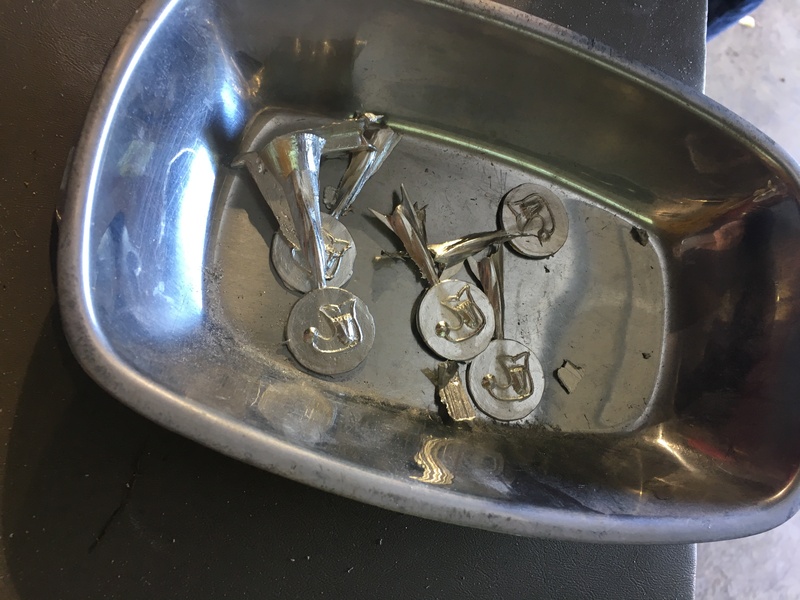 The excess metal that fills the sprue hole, and vent holes, is also called sprue and must be removed with tin snips or wire cutters. The edges of the medallion are then filed or sanded smooth. The cut off sprue, and mis-cast medallions, are simply dropped back into the cauldron to be melted down for the next medallion. 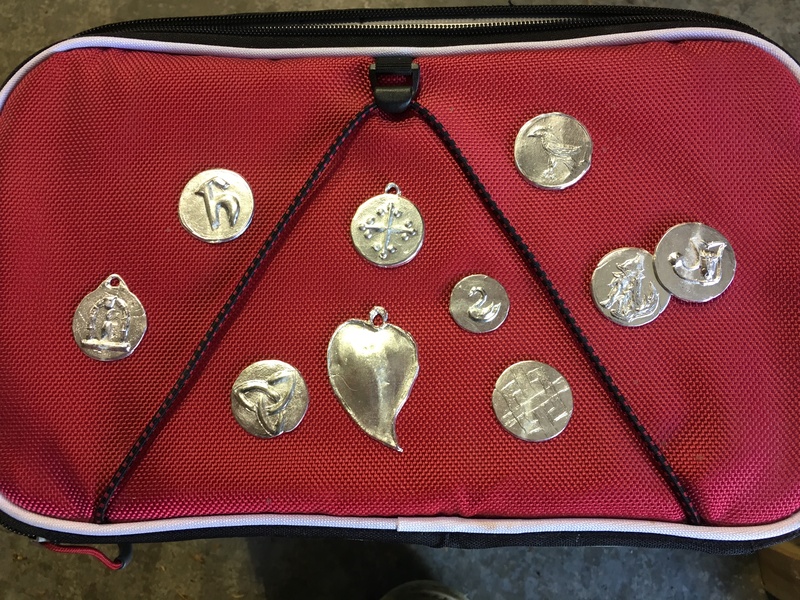 Below we see Duchess Dorinda’s finished pewter tokens. The loop will need to be drilled out on a few of them. Shown below is a medallion that has both a front and a back. Notice the pins and pinholes in the mold so that the images line up. 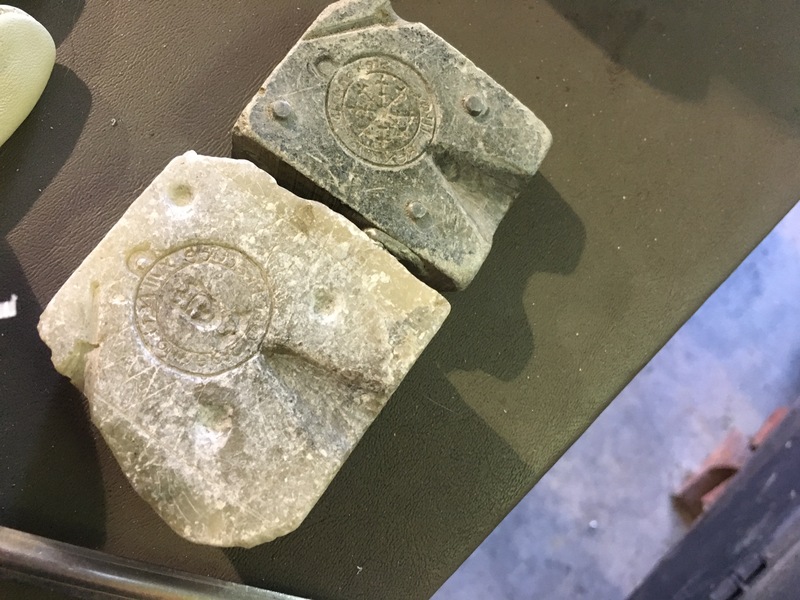 Here are the two medallions cast from the mold above, showing the back and front of the completed design. 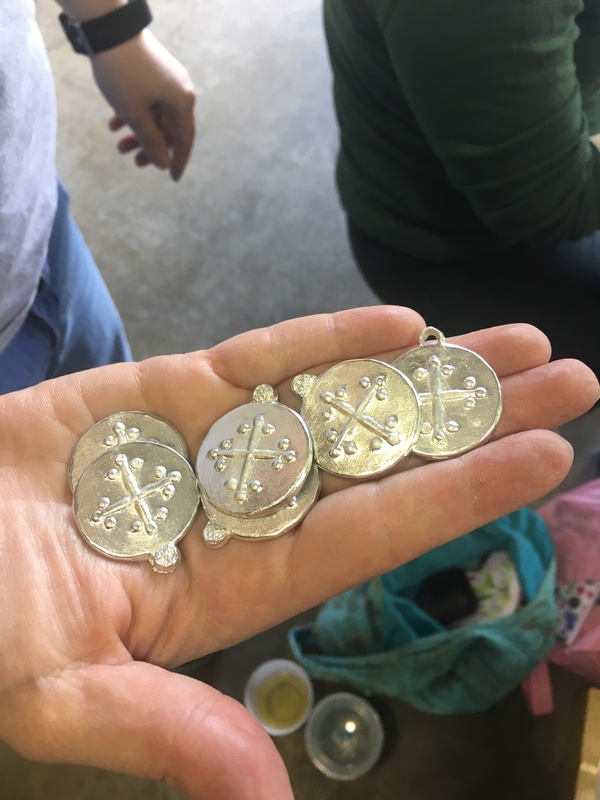 Shown below is a mold allows you to pour five medallions at once. Again, note the pins and pinholes to make the front and back line up correctly. Completed tokens from every member of the class.